Live on BBC Radio 5 live sports extra, BBC Radio 4 LW and online, and text commentary on BBC Sport website. England captain Stuart Broad says rest rather than more practice is the best preparation for the second Twenty20 international against South Africa. Broad's team go into the match on the back of a seven-wicket defeat in the opening T20 match at Durham. 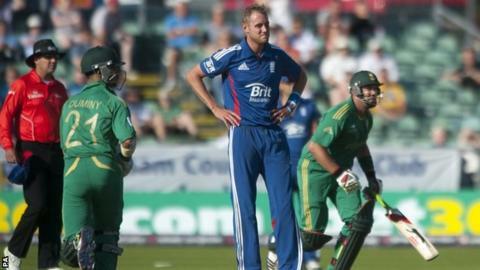 After a hectic summer, Broad decided against compulsory nets before Monday's game at Old Trafford. "It's a tricky time of year. You don't want to be netting all the time. We've had a long cricket season," he said. "Whether going to the nets and doing certain things is the best thing to do, we'll have a discussion about - or whether getting away and actually having a think about what we do [is better]." England play the third and final T20 against South Africa at Edgbaston on Wednesday and fly to Sri Lanka to defend their ICC World T20 title the following day. Despite his side losing four wickets to spin in the opening match of the series, Broad has no concerns about how England will fare in that respect in Sri Lanka. Broad added: "We didn't play the spin especially well but we've got good players of spin in there. "[Eoin Morgan] is a fantastic player of spin. We've seen him dominate it in the past. It just didn't come off for us [at Chester-le-Street]. Jos Buttler, in training, hits the ball further than anyone. "We want guys to have the freedom to go for that boundary option. You don't want to curb that enthusiasm too much but obviously it didn't work out for us, and we need to put that right in a very short turnaround." Before that match, England's women take on West Indies in the second international of their five-match series, having won the opening match by an emphatic eight wickets. The match will be live on BBC Radio 5 live sports extra from 14:00 BST. England (from): Stuart Broad (captain), Alex Hales, Luke Wright, Ravi Bopara, Eoin Morgan, Jonny Bairstow, Jos Buttler, Craig Kieswetter (wkt), Graeme Swann, Jade Dernbach, Danny Briggs, James Anderson, Steven Finn, Samit Patel, Michael Lumb. South Africa (from): AB de Villiers (captain, wkt), Hashim Amla, Richard Levi, Jacques Kallis, Francois du Plessis, JP Duminy, Robin Peterson, Albie Morkel, Johan Botha, Wayne Parnell, Dale Steyn, Morne Morkel, Justin Ontong, Lonwabo Tsotsobe, Farhaan Behardien. Umpires: R Illingworth and R Bailey.